for Laser and Inkjet Printers, 3-7/16" x ⅔"
Organize all your important file folders with the convenience to remove labels cleanly and update as needed. 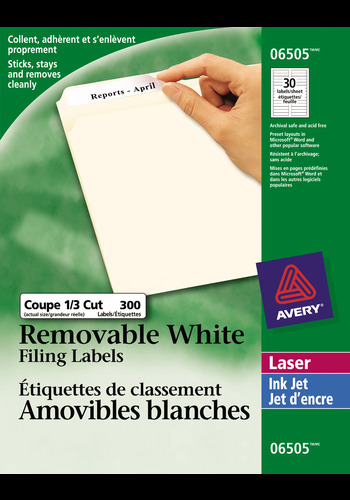 Removable File Folder Labels are designed to stick and stay put while offering a professional-looking label. Create file folder labels with blank or pre-designed templates using Avery® Design and Print Online and a laser or inkjet printer. Organize all your important file folders with the convenience to remove labels cleanly and update as needed. Removable File Folder Labels are designed to stick and stay put while offering a professional-looking label. Create file folder labels with blank or pre-designed templates using Avery® Design and Print Online and a laser or inkjet printer. Use Removable Labels to file folders, label boxes, envelopes, packages and more with the freedom to change, revise and update materials as content changes. The labels stick, stay put and remove cleanly once the job is done, so updating information is a breeze. Efficiently and effectively file and identify systems and property without damage.